Sharing Model Reveal - Earn While You Learn! What if I told you that you could earn a full-time income simply by sharing awesome training and blog content...would you be interested. Well this is a reality with the Sharing feature within Wealthy Affiliate. Although we have never been an advocate of “click button systems” the new sharing component of Wealthy Affiliate is really as simple as that. Find something you want to share, click a button to share it via one of your favorite social networks or email...or grab your link and post it wherever you like. When you share something from the Wealthy Affiliate community using the share buttons, your affiliate link is automatically passed through and you will get credit for any referral that signs up. This is going to allow you to earn income while you are learning here at Wealthy Affiliate. 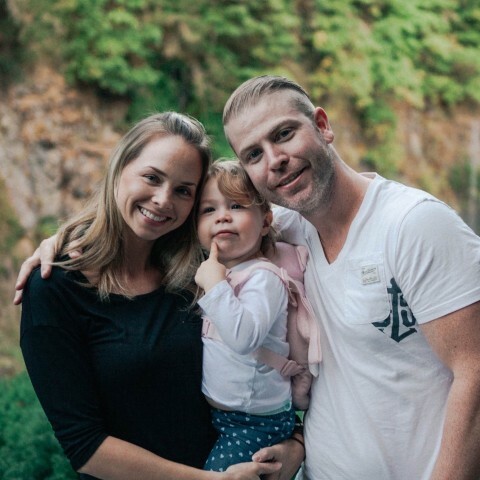 Within this training tutorial I am going to walk you through the unbelievable potential of the share model and show you how you can easily implement it within your day to day schedule to earn a consistent stream of income. Before we get into the details, here is the infographic walkthrough outlining how the Share Model works. Source: View the Full Size "Share Model" Infographic Here! WOW I am so inspired now and ready to go go go. I am pumped. I am on it right now even though it is the middle of the night here. But I guess someone somewhere is awake and waiting for what I am about to send. Thank you so much for this training I really appreciate it and all that I am getting here. Hello Referrals here I come. Thanks and very informative topics and i must say i have learned a lot! If anyone is confused by this all you need to do is click on the "Affiliate" Button just below the title of the post (right-hand side) and use that link (which contains your affiliate code). Copy the link and past it to whatever social media channel you choose. Well, I have read something like this before and have tried to share but did not see any share button. If this problem is solved everyone will be benefiting from this. I have made a request for a long time now concerning this but nothing has been done yet. So we wait, as things gets improved we hope that will too. Thanks for sharing your thoughts. Is it only me, or is it with everyone? I cannot see any tweet button on the courses nor on my written posts to share it with Twitter. Or should I copy paste the affiliate link from that page? "You can also share content via Twitter with the click of a button. Within each page you will see a Tweet button (as shown below)." This is old training and in the old days there used be a button for various things. But even the Facebook Share Like button has been removed. The only thing you can do now is use the email share and/or the Affiliate Link to post in Social Media. I think nowadays sharing on social media options are not available? Why would you think that? Sharing on Google + is a must in my book. My posts on Google+ gets ranked faster and higher in Google than they do by themselves. Instagram is getting quit popular with marketers. This will be perfect for traffic exchanges where people want to learn about affiliate marketing - that's why they are there - but they get conned and need your help to get out of there. i dont understand how to click on and share . And share post from where? WA's post or others ? any answer ? you share by doing a couple things. First, click where it says affiliate. Then put the link in your post or page. Share the post or page with the link. Or you make a blog about a WA subject write about it screen shot whatever you want to say about it and attach to an image for it. If you open the envelope you can send it as an email. Where is the Turning Your Content Sharing On/Off located at? This is an awesome opportunity! I love the action schedule also. very helpful when creating a concrete structure. Thanks Kyle. Kyle, I like your service and sharing model that make our world the best place to life, to evolution, to happy and together. Kyle where is the share button and options located.This would make our life so much easier instead of copying and pasting which is time consuming. Near the top you will see a button that says Affiliate. Click on it and it will reveal your affiliate link. Thank you Ken I was having trouble finding that. That is quite business model!! Is this option still on? Should there be some share button or ? Can we share Jay's webinars? This seems like an excellent way to get the world out about WA while your just getting started! Does anyone have suggestions about which pages have been most successful to share for them? I have taken action from the instructions within this tutorial, and have shared links on a new twitter account I created, with about 20-50 unique clicks showing each day I have sent out tweets with links back to WA, but have not gotten any referrals from the traffic. On the plus side I seem to get a few new followers every time I post articles/tutorials from WA, so if you are trying to figure out ways to grow followers on twitter, this seems to work! You can drop a link to yours if you have it set up if you want me to return the favor! hi. i'm trying to share a training by sending my link via e-mail. Pressed the box with the mail icon and supplied all the needed details in the mail but when i press the "Send" button, nothing happens. Every time you hit the button the mail gets sent. The sensible thing to do is to use your own email address to test that you received it. Otherwise you are bombarding whoever you are sending it to. hi again chris! tried using my own email but received no mails...so i just composed my own and attach the affiliate link. Trying right away. Thank you for this Kyle. So if I read a blog on WA THAT I like I am allowed to share on pinterest? Do I get credit for that? Yes, Tina. On Affiliate Bootcamp, lesson 1 you can join the program and all posts you want to share have included your affiliate link. Can you share a post from your G+ to face book or twitter? You should be able to. Just navigate to the post you want to share and then copy the url and paste it into fb or twitter. There is a tool called Zapier where you can set up automatic reposts (called zaps) among your social media accounts - I use this to auto post tweets on one of my accounts to a facebook page. I think it's free - don't remember paying! Pretty amazing.I just tried it now. Excellent strategy and great content. Question....What about sharing trainings from the premium program? if we share that affiliate link how will they see that training if they are not a premium member? Starter members have access to premium training for one week when they first join WA. That's the best time period for them to view. iv shared links on fb but that's not my point at all....im talking about sharing our premium training links with people who are not members of WA....how will they open premium training links that we pay for if they are not members? that's an awesome training thank you! Although it doesn't answer my question lol. Maybe im asking it wrong lol. Thanks for your time KatieMac I appreciate it! Hi I'm a little confused. In this tutorial it says that at the top of each tutorial there is a share section. But I don't see it. Also where is the permalink button to get the shortened affiliate link? I notice this tutorial was Nov 07 2012 has the system changed? 1. Hit the "Like" button at the top of the page. 2. Drop the "Affiliate" link (also at the top of the page) and send it out wherever you wish. Thanks Chris I guess the format has changed ,no instant SM buttons. Drop the affiliate link and shorten it at bitly for tweets? Lots of bit.ly and goo.gl fans here at WA. Not sure what this was about, I presume you made a mistake. It certainly wasn't an answer to my question. I cannot see Like buttons, or Share buttons on any of these pages/tutorials??? At the top there is a white button with Affiliate in it. Click on it you will see your affiliate link. You can share that anywhere you like. There is also a Like button at the top. We had an ad for Cremora - coffee creamer (don't suppose you would have seen it . . ) "It's not inside . . it's on top!" Did you put it in your profile? I've posted a question regarding the screenshot as it doesn't correspond to the current real Blog Post Format. Perhaps it just needs an update. What part of it do you think doesn't correspond? Excuse me, I cannot find the share button and when i press the like button it doesn't show on facebook.. Should I copy and paste the link? same here. Could not find the plus one button. Hi Kyle thanks for this tutorial, I seem to be having a problem with facebook bringing up the image I want, it seems to automatically put up the image of my signature, grrrr why is this? Hi Justine, this is a known problem with the sharing-buttons to facebook, and it's all facebook's fault. FB have an app where you can "fetch" the image you want to show when share, but this have to be done when you place the pic in your post. Too much to explain here, but you can find all about it under facebook-help om FB. What I do, is to copy the pic I want to a folder on my desktop, then click "add photo" on your status, paste the photo, write your message on top and place the link there too. Then post it. I have the same fear of Twitter, and also Social Media generally; I have been avoiding that scene generally, but with my interests, I knew the time would come when I would have to embrace it, and I will. It will eventually become second nature for all of us here, I expect, just like engaging in the community here :). It's like being sucked into a whirlpool, or quicksand. I'm probably at the same point as you in reaching a point where it's easier to turn and face the storm than to keep trying to ignore it. (sorry for the mixed metaphores). I'm just starting Course 4 (Soc Med) so I hope it will all come clear soon. I had been experimenting from time to time so I have several accounts at each social site and I currently have no idea if any of them are of any value whatsoever. You certainly have been more active than I have, and will have a head start if your accounts are set up. One thing I have found is that the unknown is usually far less difficult or incomprehensible as we might think before we plunge in - well, it should all come clear sooner or later! In the meantime, it seems like you are making great progress, Chris. I still have a huge way to go, but decided procrastinating is not going to get me anywhere, and I am here on a learning adventure. Wishing you every success, too. okay when they say $1 in credit mean? each time someone signs up for WA through your affiliate link, you get $1.00 credit. Almost correct. I think they have to complete their profile, plus another task. WA delated twitter and g+ buttons? i mean this training has 3 years old, maybe it is not longer necessary so they just let facebook button to be able to share content... anyone has the same trouble? or i just need to copy and paste my affilitate link and share ? thankyou! I do not have these buttons on every blog post, training resources or profile. I created a fecabook page for WA, but I can not connect to groups, someone knows how to do it? The group part on my personal facebook appears on the left, but on the WA page that I created it does not appear anywhere. On the left side of your page you can invite as many friends as FB will allow, and then I usually write a post from my new page for my Facebook page about my website and it will post to my personal page to share with friends. I do not see the SHARE BUTTON that the training here says it should appear. Where are these buttonss??? Hey Demetris, thanks, yes I just installed "Twitter, Like, Google +" on my two Sites, is working well. hello, I do not see a Share button, I see a Like button, and I share WA "getting started" lesson to online marketing groups on my Facebbok, but if soemone affiliates to WA by checking my facebook, do I receive comissions? ?How do I connect my Facebook with this??? Also, how do I share my content (of my Site)??? your affiliate link is synced to every single training, lesson, post, etc. here on WA. It's at the very top of the page, the white icon that says, "affiliate." Click on that and you can access your unique affiliate link to share anywhere you want. You don't have to connect this to FB or FB to this. on the left of this menu, there is the WA affiliate program. There you can find your affiliate links which you will be sharing. When you create a blog in here, you can share the blog with everyone, and everyone can come and see....don't worry about you receiving your commission. You will receive your commissions no matter what. There is a special algorithm in this system where it remembers whoever joined your link the first time. So if they don't choose to join the time you sent them to the site, another time when they finally decide to join, you'd still get the credit. Even if they went elsewhere...They opened up your link first and that's what counts I hope this is clear? Demetris, thanks, now I feel very tranquil that my efforts will be paid with this system. About the links on the "WA Aff.....Program" I have used them on some of the posts of my Site. If I click the G+ Share button and it gets posted to my profile...will it be tagged as spam? Because when i share my direct affiliate link it is marked as spam. Be very careful. I got a warning from G+ the other day for posting a direct link. It then wouldn't let me link posts on my blog with Wealthy Affiliate banners in it. Someone else sharing my blog post had no issues so I think it was probably related to the warning the time before on direct links. I ahve heard of at least one other affiliate who was banned from G +. No such issues with Facebook or Twitter. I like this tutorial especially the schedule on lesson 12,will put it to good use Thanks again. Not sure if I am over complicating this because it's that simple...but I don't see any share feature for FB or anything really...I have a affiliate link button that has the long link but that is it...Thanks for the help! The share button will be on the pages you want to share To facebook, they will not be On facebook. You will see the F Like in the upper banner. Also on blog pages that are integrated with facebook will have the same F Like, and some will have the Share button. One will show to facebook that you 'Like' this post (or what ever post you 'like'ed to. The other will share with your facebook the Title, a short description, a pic and a link so they can click on it and view it themselves. You can also use the link provided from the Affiliate button and manually share the content you wish on your preferred social sites. Doing it this way will allow you the freedom to customize the post more. HELP!! i cannot seem to find the share buttons and i only get the long affiliate link! where do you check to is if the share is on. I didn't see those icons with share to earn and share wealthy affiliate. I looked in my profile and I didn't see it. I actually named my site earntolearn a few days ago, not knowing if i was heading in the rightdirection.And now i see this tutorial. Awsome! Yes Kyle - this is MORE THAN AWESOME! This is an amazing tutorial! Why, oh why, did I only find this now?! How did I miss it? Well now you found it. You can take advantage of sharing ANY content here within WA and earn affiliate credit. Pretty awesome right? I was just wondering if I could make a page on my website JUST about wealthy affiliate? Basically like a page that says: How It all started. I would really enjoy telling people on my future website that I create and how it all works. Idk if that is like promoting or anything but I am sure it would help referrals and get people more familiar with this website. It is truly an amazing experience. I am sure that would be fine. You could also write about how with WA you managed to build your website at minimal cost and the challenges along the way - make it part of your story. Some people spend $$$ to get a very basic website built for them, and continually spend more when they want it altered again. Go to your My state link near the bottom of your page clik that,and go to your afiliate link at the top. I have a problem that I need help with, I'm so frustrated. I want to share the earn to learn site. I want to try to earn something so I can upgrade (my trial period is about up) My facebook button does not say share, it gives me the option to like or unlike. I don't see a share button to turn on or off either. Finally, there's not a global activity button or personal button on my dashboard. How can I fix this, I want to move on? click on the affiliate link button right below the title and you will get 2 links both of them will have your affiliate link id number on it. The first one is a shortened version and the second full length you can use either one on facebook but use the shortened on ones that do not allow the longer ones like Twitter. I set-up my Twitter account, but did not see how to set-up the email account, like @twitter. How can I set up such an Twitter email? You cannot set-up a twitter email account. I am very interested in sharing training and blog content, especially because it could lead to a full-time income. Thank you Kyle and Carson for making it so simple and easy. Hi Kyle, can I put a WA banner on my personal blog that's not associated here? You can use the banners anywhere you wish. I use them on my outside blogs as well. Using WA banners is a great idea. I'm glad you brought up that question. Does the content shared have to be from within WA? Not sure what you mean? If you want to share content from WA, you can use the share buttons here. You can share any content you want within the online world though, it is up to you. This is probably an obvious question, but who would I share with? Kyle, Is there statistics on what "shared content" has created the best results. 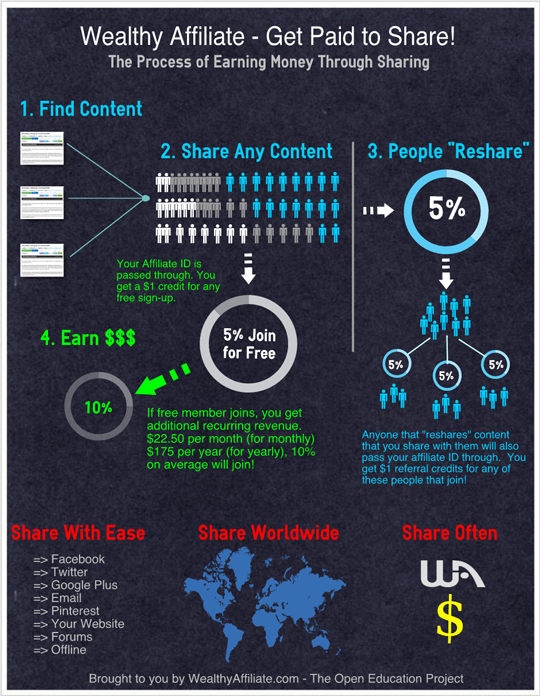 (sign-ups) The sharing is great, but when you look at it; It's a bit like lots of people/affiliates doing a huge split test. Results posted would be useful, I think. I normally just share something I like or think others may like. Maybe you already have this happening? Head to the Control Panel aspect for more sophisticated stats. I need clarity on something. I realize that if you have a blog that you can share links to content here at WA via the sharing model. It is easy to find great things here and blog about what you learned or your take on it and share the link to the content in question here at WA. I can share from my outside blog to things here at WA. My question with the sharing model is can that be done here on the WA blog? Like for instance, I read a blog post from someone or a discussion or a training and I have my own thoughts or take on it or whatever, can the sharing be done right here at WA on a blog post or is that too much interlinking within WA. I have not utilized the blog feature here at WA. I have only ever blogged on my own self-hosted Wordpress sites, but after reading Carson's blog post today, I decided that I have a great blogging tool right here at WA that I have overlooked. I like to blog about various topics, but I have been told that it is okay to blog about business, personal, current events, etc. provided you are not linking to affiliate products, etc. but I wanted to be sure whether sharing WA links from a WA blog post is okay. If not, I will just do it from my own blog. Well if you share here at WA, people are already members so there is no way to earn credit. It is beneficial for your member rank to contribute to conversations here at WA and to create blogs and discussions (as these get ranked and you get credit for them), but to share WA content within WA has no benefit unless you are helping someone out with a link to a resource or a post. That is what I thought. I think that I got confused because of Carson's blog post "Top of Google with Wealthy Affiliate!" because that post talks about people outside of WA finding our WA blog posts, etc. on Google. So, I wasn't even thinking anymore about current WA members seeing my blog posts, even though they would too. ---Yeah, I think that I will just use the sharing model aspect when blogging from my blog outside of WA. I can utilize the WA blog here for other types of blogging that I want to do. I like to blog about a lot of topics. Yeah,anything related to your business and your activities online, blog about here and anything that is related to another niche, put on either your website or leverage an authoring site like StreetArticles. Then go for it. You can share anything here at WA and earn referral credit for it! Amazing how it works, earning and learning, it's mind blowing. Yeah, it is easy to share something in particular when it is going to offer a lot of value to your audience. Hi Kyle, I am currently on Linked In and I don't see any button for that network. How do I get share in that network? There isn't a button here for Linked in. You can grab your Affiliate Link directly and share it on linkedin if you want. Click the Affiliate Link button on any page within WA and that will provide you with your unique affiliate link. So.... do I create a website for this? Or do I just share this link everywhere? for example, if I made wealthy affiliates my niche, I will make articles and bookmarks and engage on social networking, etc. I would simply put THIS link rather than a link to my website? Because if I have a niche of "canoes", I'm building and entire website about "canoes" AND creating articles, etc with the back link to my website. But I don't need a website to use wealthy affiliates as my niche? Just this link? You can share these links wherever you like, whether it is on your website or social networks...wherever you can post a link you can share these links and get credit for them if someone ends up joining as a result. OH , sorry .... one more question...can you use this WA affiliate method if you are on the free member or is it also just for premium users? Hi everyone. I have a question or two. #1. What is Google+, and #2. You can't use this share method unless you are a premium member? Thank you for answering my questions in advance. Google+ is a social network, like Facebook. You can use the share as a Starter member if you want as well and earn commissions (although Premium members earn double the commissions as starter members). Hope this helps! Thanks Kyle, I appreciate the reply. Kyle, I have this idea in mind. Can I be permitted to turn some of these tutorials here in WA in to pdf and then share in document sharing website. What I intend to do is to create a table of content, then share a quarter of the what was listed in the table of content. then include my affilate link to direct them to WA. of course I would write the name of the author or simple from Wealthy Affiliate. Can I be permitted to do this. NO! We do not allow content from here to be copied and reproduced. This is copyright infringement. That is the whole reason that we created the share system so that you could SHARE content here at WA through your affiliate links and earn revenue. I suggest you do this, but don't create PDF's from the content here. That is not allowed. Share model infographic: Ok, Kyle this is where I needed the clarity I asked over at WA walkthrough. Now I understand the credit and share model. And sorry to insist, my error was that I thought this worked like a pyramid, now I don´t think that but for the sake of clarity and if someone familiar with pyramidal systems asks: Let´s say I invited my friend Mary and she becomes a starter member, I get my credit. Then Mary invites Patty who signs under Mary´s affiliate link. Mary gets her credit from Patty and I don´t get a thing from Patty. I oversimplified it but I´ll be explaining this in spanish and want to make sure I pass the info correctly.. Always grateful to you for taking the time. Pyramids are illegal. We are not a pyramid lol. You would not get credit for Patty, that is an MLM and they are highly unethical and often times illegal. You get credit for all the people you invite, it has nothing to do with the people that they go on and invite. That settles the question and I am prefectly ok with WA not being a pyramid. Yeah, it is very easy to use and there are a lot of benefits to sharing content regularly here at WA! 1. Whenever i add a new content as a blog and it is viewed by the existing members of the WA community, will i get revenue by their clicks on my blog? 2. Secondly, once the existing members of the WA community ,views and shares my blogs with non-members and they in turn register as members, apart from those members who get revenue from new joiners will i also benefit in terms of revenue from their joining as a free member or premium member? 1. You will not get revenue if people here click on your blog. If you provide valuable information, you will obtain a bigger following here within the community. Absolutely NO promotions are allowed within content you create here at WA though. 2. You will benefit by getting an automatic follower for anyone that joins as a result of your content. Your content will also get indexed in search engines, and when it does, you get 100% for all referrals that this generates. Where can I find Turning Your Content Sharing On/Off? Is it under Main menu or a special tab? It must be easy, but I cannot find it. If you are trying to turn off content you've already posted, you will need to select the green Action button then the edit button on that content's page. Scroll to the bottom of the content and you'll see the option to turn off sharing. If you are creating a new blog entry, you will see the option to share at the bottom of the blog's content. Sharing is "on" by default, but you can choose to turn it off by clicking on the bright green Sharing On box. A drop-down option to turn it off will be visible. Click on that, and a bright red box saying "Sharing Off" will appear. Do Share Links contain any tracking data, or can I put a tracking link on to them, I am getting clicks on my account but am not sure where they are coming from! You can add tracking data to the end of your "long" affiliate links. The share button links don't though. I'm still working on my niche choice and have not yet started a website/blog yet. Can I still share or post a link or something on a site or FB and get credit? I have a lot to learn and much of this stuff is all so new to me. Absolutely, that is the beauty of this., You can share any content here within WA via Facebook or otherwise and get full credit. Use the share buttons (automatically pass through your affiliate link) or grab your Affiliate Link if you want to copy and paste it somewhere. @kyle..Sounds great.., achievable but lots also guidance. I think my biggest problem is the writing of the blog posts cos I simply will not know what to write about. Can you advice me on this please? You can share other people's blog posts, including mine :) At first you can blog about your progress, what you have done, any successes (including what you have built), etc. Basically blog about your path to success and things that you are learning that could help others out. Your assistance is highly appreciated. There's a lot of things to know and I'm beginning to like it. Not a computer wizard but the programs amazed me. Thanks Carson. It is very easy to share content here, it is powerful, and it benefits your readers. Not only that, you are rewarded for the content you share here at Wealthy Affiliate if someone joins because of it. I do recommend you follow through the following course if you are interested in some easy and free techniques you can use to promote WA (or any other program for that matter). I'm happy to see that you are working through the training here at WA. Those who are dedicated to their training achieve a lot in terms of Online success and growing a business that generates income. Keep up the great work. It is interesting and I kinda like working with computers. I was referred to WA last year, and in signing up a few days ago I didn't go thru him to sign up, is there any way after the fact I he can get credit for me? Unfortunately no there isn't a way to connect someone after the transaction. However, if you went through his link at some point and then came back and joined they would have gotten credit for the referral as we offer lifetime cookies. so I can share any given article, post, etc one time but if I choose different topics or posts I can share as many as I like correct? You can share whatever you like as many times as you like. Basically you can earn revenue by sharing quality content, how cool is that? This is amazing,,,,, why have I wasted so much time and money on other stuff that may or may not work but I couldn't grasp. Maybe I am ahead of myself but if I am understanding this I can take any information I want to share from WA and post/share wherever I want right? So how do I share it with another blog site. I don't understand the steps for doing that or is that a little later. You can simply post a link to it from another blog. You can earn money by clicking any of the share buttons (automatically pass through your affiliate link) and you can post the Affiliate Link associated with any blog post or training wherever you like. Is there a vehicle to share with Linkedin or do I just need to put my affiliate link into my profile somewhere. I love learning this stuff. You can copy and paste your Affiliate Link associated with any blog post or training into your linked in profile and you will get credit for it. This is an absolutely awesome way to show us neophytes how to really get started earning online. Simple work - just helping others to succeed will make all the difference in our own success! Viral - what a concept! Absolutely, share something every day (basically offer value to people) and reap the rewards of your sharing. You can share anything here at WA and earn credit for it through either the social share buttons or using your Affiliate Link. I sent a Facebook message about WA with my link. It was not sharing something here. It was my own message leading back here. So, does that mean I can't go back in and do the same thing whether or not it is a FB like? Because I get stuff all the time from other companies on a daily basis. I may not understand this. Above did you leave out a word after particular? I just want to do this so much. I follow your training and love it and want to do it right. Thanks Kyle and Carson. Okay, now I just need to know how to promote my Google + so I can share with more. I will check into that. This is sounding good. I am excited. Yeah, you might want to get working on your G+ account as the benefits of G+ are becoming very real and widespread in terms of social and Google. yes!!yes!! this is the way to learn the site also...for me at first it was info overload...great idea..
Yeah, this is a simple plan that you can utilize over and over again to earn ongoing credits and referrals. Take action on this schedule and you will see consistent action within your affiliate account. Thanks Kyle, I've been sharing and have one invited so far. Yeah, it is very powerful. 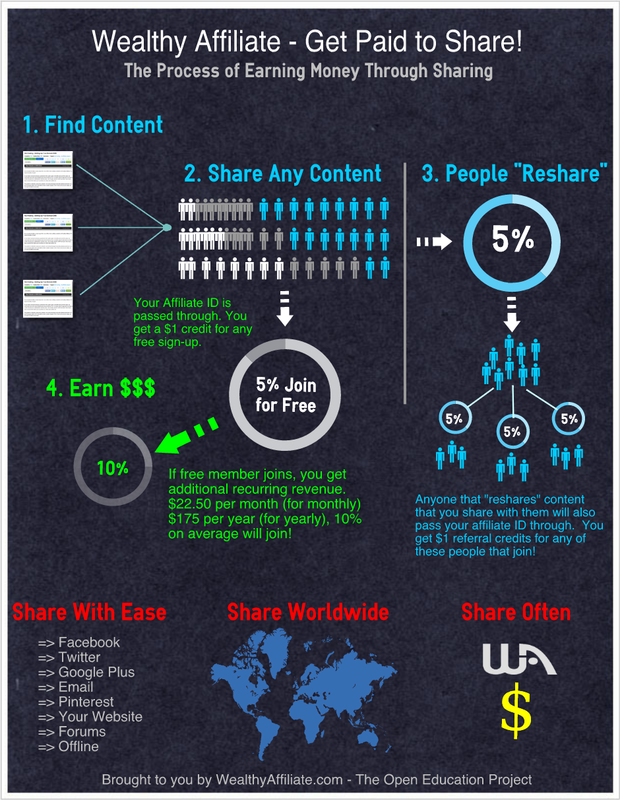 You can share ANY content, including all of mine and earn referrals in the process. There is a lot of daily activity and new content being produced every day. People could really create a full time business online just from sharing powerful, informative and helpful content here. It does lead to a lot of referrals. Also, creating powerful, helpful content will lead to much success and a very large following here as well. Thank you Kyle, for your inspiring & motivating advice. Wow! Have I been leaving money on the table! I just finished this training! Where have I been???? Yeah, share content and earn. It is that easy! When it says $22.50 per month...does that mean if someone signs up for the monthly membership bc I shared it with them, I receive $22.50 every month or is that just $22.50 once? You will earn $22.50 for every month they remain a member, not just the first month. :) This means if someone were to sign-up and stay for 10 months you would earn $225.00 in commissions (which is a more than typically scenario)! Kyle, can we use the commissions to become a member? Well the commissions do get paid out to you and then you can use the money in any way you like. You can't actually transfer commissions into a membership at this point, but that is a good idea and something we are considering in the future. Sharing on facebook, etc. Can the same be done on LinkIn? Absolutely, grab your "permalink". This is your affiliate link that you can use anywhere, within any site, social network, linkedIn or otherwise. OK, Now I could use a little help here. Is the perma link on my profile page? Or do I use the link on the blogs? This is all new to me, sorry for taking up your time. do i need to sign up in order to get the commission? Yes, that is the only membership level. If you are free, you only have access for 10 days meaning that you could not be paid. You can definitely earn within this time period, but in order to be paid you have to be a premium member. What is the payment method used? We pay via Paypal on the 1st of every month. We can also pay via check if you reach over the $100 threshold. When you say share content, what kind of content do you mean? Are we sharing a website, a product, a blog....?? You are sharing blog posts and training here within WA. When you share this (via the social buttons or the links provided) you will earn referral credits for anyone referred. I am glad I have slow down to really read this. Now it is time to share!!! Hi Betts. Sharing is a valuable asset that you have in your tool belt here at WA. You can share any content that you like, earn referrals, and ultimately earn recurring commissions when people join. Sharing WA can earn you a significant income and build you a recurring (and steady) income stream over time. Sharing WA is highly recommended to ALL members at WA. Sharing can be done in many ways other than simply emailing. You can share on Facebook, Twitter, Google+, etc. You can share to friends and family who may be interested in learning about earning money online. Try sharing some of the training or a blog post that you find helpful. Building sharing into a daily routine here at WA will greatly benefit you. It's easy traffic! this has given me a lot of insight! Glad it could help you out. Sharing is an easy way to get reach, referrrals, and offer value to people. Sharing great content is only going to benefit you! I meant to add, the value of the infographic is substantial. It is such a concise way to review lots of the content that's in this tutorial. After I finished reading the whole article, I went back to the infographic to look at the numbers you use (which I realize are well thought out from your experience) and I was reminded of the potential value to me that happens when people reshare. Very cool. Yeah the potential is vast and sharing quality content with your audience will only increase your credibility and will lead to revenue potential. Thanks for your feedback! Gosh, Kyle, this is great ! (why am I not surprised...). I'm so glad you included G+ with reminders of how to work within its parameters. And there's little points in here I never thought of...like sharing my WA profile as added credibility. hey all, especially @Carson or @Kyle, I have some questions pertaining to this sharing of content. If I hit share or tweet, is my affiliate link included in this? Also, like after I hit tweet, a message that others will see shows up. Am I able to edit this to make it more appealing to my personal audience w/o messing my personal affiliate link up? Also, if it's not an affiliate type of link, how am I able to share something I find interesting to my audience that is here on WA, and it be an affiliate link? A couple questions that I would love anyone to answer, thanks guys. Yes, when you share using the buttons within any blog post or training it will pass through your affiliate link and you will get credit if anyone signs up through that link. Also if they "reshare" the page you will get credit for that as well...it could become quite viral. Thank you, Kyle, As always, good information. Kyle, when we set up our website to promote this project, can the site just have the one page with our content on it? Do we need a privacy page, a blog and so forth? I'm going to use Word Press for this. Should I just use the blog page without comments and hide all the other pages? Thank you. Great questions Goldenlady! What sort of response have you received from Kyle? You don't need a privacy page, but sometimes they are good to have. In terms of linking to the content here at WA, don't copy the content, rather point people to this content from your site. Privacy policies are not mandatory, however Google does look for them and it can be a good thing to have on your site as they are pretty standard. From what I understand, every person that signs up for the "Free 10 trial" via your shared link is equivalent to $1 CREDIT. This does not get paid into your bank account until one person actually becomes a paid member of Wealthy Affiliate. You can just look at the top of any WA page and you'll see "Invited," "Followers" and "Rank." Whatever number you see in the "Invited" section is equivalent to dollars in credit. We have to wait for Kyle's/ Carson's confirmation on this. Also what would be helpful is knowing where these "conversion traffic" is coming from. I know if you go to "Share Wealthy Affiliate" section (in the left margin) there is a "View Sales and Clicks" button on the right side. This takes you to a place where you can view "Reports">"Raw Clicks" and that shows you referring URLs and Tracking IDs (if you are adding tracking IDs ---aka 'custom variable' --- to the long Permalink you are sharing). However, I do not know which one of those referring URLs converted into a free signup, or better yet, into a PAID member. Anyone knows how we can track conversions with this "Sharing Business Model?" This $1 credit will get put into your affiliate account. This logic will be added very soon, but you can use your "invited" tally as this will be the total number of referrals that you have. This person does not have to join to become a full member in order for you to get credit. Also, you will get any referrals if this person does decide to join as a premium member here at WA! Yes, I understand we get credited as soon as they sign up for the free trial. But, that does not turn into cash (as in a paid commission) until one of our referrals actually becomes a paid member ... is that correct? Anyway to see where that conversion came from? I checked the Reports area under "Raw Clicks" which shows the referrer URL and the tracking variable, but I don't see any conversion data. Thanks for the information. You can add data variables to the referrals that you perform. There is no specific data associated without having this, but I can tell you that the highest converting post right now is the "Invite to Become a Remarkable Entrepreneur" blog post. Search for it within the search tab above. What would be a good webhost to have many affiliate web pages or sites with different products? Does each product web page need a domain name too? You can use the hosting here at WA...it is included and your site will be hosted on our state of the art servers. You could have a singular domain to promote many different products, it is best to create a website that is relevant to a theme so that your audience will view it as being relevant. im trying to learn this more and thankful for helpful emails and comments. No problem, do let me know when you have any questions. Thanks Kyle. I'm going to try this. Great, let me know how things work out! I must confess my G+ account has gone beserk with the amount of people adding me. Proves this works. Awesome to hear Neil! Sharing quality content will only benefit you, in particular because you get credit for it. Thanks for sharing. It's nice to know that it worked for you. I'm looking forward to completing this training and getting set-up myself. I have had similar results as well, gaining followers as well as clicks and rather quickly I might add, even have had a few retweets, (thanks Kyle) and some others that I'm not sure are WA members have retweeted too. Right now I am primarily using twitter, google + and email. Sharing has it's rewards. Great to hear! It definitely does have it's rewards and sharing "quality" content can lead to people perceiving you as a source of information (credibility comes to mind). :) Thanks for the update! Thank you for sharing also. And I am happy for you and looking forward to getting profitable results also. First off I need to apologise to Lynn, was having a tough day yesterday and the pain killers I'm currently on wasn't doing what they should, I'm okay now. Secondly I didn't read this tutorial all the way through, thought it was just one page, how stupid of me. Now I'm starting to get the bigger picture - sharing is good, in fact a very good thing to do. Will copy and save the Plan, need something to work to. The moral of this is to Create and Share, will do! I was the one that was hesitant about sharing others people stuff and I still am. I only ever share what I have created and have been doing it this way for 3 years now. Other people do share my content on the Social Media Sites, but that benefits me. Sharing links to people's info is not the same as copying content. It's just sharing links. It's how the whole internet functions. It benefits the person when you share links to their information. Copying/pasting their information in it's entirety (beyond a short excerpt of say 1-2 sentences with a link to the rest) would however be a big No No. I never mentioned copying content, nor is it implied above. Sharing links with your aff link in, that's what I'm referring to. That's fine by me, if you created the content, but not if you didn't. I guess that I didn't really understand why you are hesitant to share links. I never said that you personally mentioned copying content. It was the only example that I could think of that might make someone hesitant or uneasy about the sharing program. Some people might misunderstand what is being shared exactly and how it is shared. Now I see that some people might not want their content shared through an Affiliate link, an income producing link. If that is the case, then I suppose anyone who is uncomfortable with that aspect of it will will turn off sharing on their stuff. Since I know for sure that Kyle and Carson want their personal blogs and training shared, I will probably stick with sharing only their stuff for now. It is completely up to you Neil, there are no negatives to sharing other people's content and as Lynn has stated, it is how the Internet works now. It is social and part of people's day to day activities are sharing, absorbing, resharing, and engaging in content. I am stoked, already have over 100 clicks for 10 minutes work. Thanks again Kyle for these great opportunities. Shawn that is awesome. Great to hear and I know that a consistent sharing regime will continue to work out well for you! Those are great starting numbers. Thank you for sharing. I need to finish this lesson ASAP! I'm so freakin' excited about this! Someone mentioned in another post that they were hesitant to share other people's stuff that they worked so hard on, but that is what the world of blogging is all about. I read someone's blog post about a certain topic and then instead of merely leaving a comment on their site, I jump on my Wordpress blog and give my 2 cents about the post and then include a link back to the post in question. The person ends up getting a backlink and more visits to their blog and I get a pingback to my site from theirs. As long as I'm not stealing or copying content this is the normal way of the web. Sharing. Bloggers do this everyday anyway. This is the same concept really, except there is a chance to earn financially as well. No blog owner is going to pay referral fees for sharing their stuff (unless it is an affiliate program) Before WA was closed to non-members and so WA members could not link back to the content here like they could another website or blog post. WA sharing sort of blends the normal sharing of content with Affiliate marketing, but in a subtle way. Information sharing rather than selling. Sharing rather than selling - that is exactly the platform that we are providing here at WA. We're just a few days into this new feature and we're tweaking it and gathering all kinds of information about what people are sharing and where.. so far a lot of VERY helpful content has been shared and opening up a glimpse of the value within WA! One more question, I created a blog post about the organic case study and linked that to your blog post Kyle. If I share my blog post will they be able to go through my post click the link to your blog post and read both of them? Since no one answered this question, I will. I could have sworn I read on one of Kyle's tutorial / post (or was it Carson...anyway....) that the visitor will only get to see the page he/she lands on. If they want to check out other link on the site a pop up window will ask them to sign up for free. Great training Kyle! Implementing this on a weekly basis will create fantastic results. I love the direction you and Carson are taking WA, very cool. One question is there a way to search for trainings with videos or do you have to go through the trainings to find them? Kyle, I like to use Pinterest. One of the tips I've read (don't remember exactly where) is that along with having the link back automatically embedded when you make a pin, you can also put the web address in the description box (after your relative description of course) somewhat of a visual trigger to the onlooker I suppose. Anyway, I pinned ceugenes post about his new house, (cause it has good pictures) and sure enough if you click on my pin and follow it through it brings you to his post. (that's cool) but I also put my shortlink (permalink) in the description and when I tested it, it was block with a message from Pinterest that it might be a spammy link. I immediately edited it out. Do you think it's because it's a shortlink or would you advise to not put the web address in the description at all. Want to get your POV in case anyone else has tried something similar but maybe didn't test the link. I don't want to be a spam dog. Thanks. Update... While looking at my pin after making my last comment (see above) I just realized something else. I have always just clicked on through the image of pins to get to the original source. However, I just noticed that when you click on a pin and it takes you to a larger version of the pin, at the top of the image, under the pinners name it will say something to the effect of (in this particular pin) Pinned 32 minutes ago from my.wealthyaffiliate.com and that link worked just fine. Just a little FYI, that I just learned FWIW. Didn't mean to make that a clickable link in this post, I did a copy and paste from my original pin. sorry. Story sounds familiar; most worthy words anythings worth while takes time. This takes time, but I have never seen such a large volume of quality information. 30day training will give you an excellent start of understand what internet marketing is. The live chat is a great place to ask questions this is found right up corner in the dashboard module. Best of luck. If you're after a successful online business, then you are in the right place to learn everything that s required to accomplish this. We have all the tools, training, and as you can see, support channels at your fingertips. The only thing that could stand in your way would be to not use WA to your advantage! I look forward to helping you out and being part of your path to success. Hi guys, I've had WealthyAffiliate bookmarked in my browser for over a year now, but have failed to sign up due to lack of time! Now that is not an issue, I'm motivated and excited to learn as many concepts and viewpoints on marketing as I can. Thanks for this opportunity, and I look forward to learning! Awesome stuff! Great to have you here and I definitely look forward to working with you. Glad that you have made the decision to join and do let me know if you need any help along the way. The new "sharing" component is going to be a good way for you to get others interested and benefit financially from as well, so let me know if you have any questions about this as well. Welcome! We've all been there where we wanted to gen in but was afraid of investing money before seeing any ROI. What's ironic is that people (myself included) are willing to pay $10,000/yr for traditional education but are gun shy to pay $600/yr to learn how to create an online business that is basically recession proof. In fact, problems are money making opportunities for online marketers. Lucky you (or any newbie here), there is this SIMPLE "Sharing" business model that anyone can run with. We never had this a few years ago. I hope you don't give up on your dream of making a living online. @SquidooSlfMstr - Couldn't have said it better myself. People (myself included) line up at Offline Universities with checks in hand ready to pay tens of thousands of dollars for an education. In the online world, WA is as close as it gets to an offline degree, but you're getting much more. Offline universities could NOT teach online business. They cannot stay current enough. WA is the ONLY place you can get a real education in online business, and for a fraction of the cost of offline institutions. Well said. The reason most members I've talked to over the years take time deciding to join WA is because of all the scams and misleading products out there. With our new sharing capabilities we can now give people a glimpse of the immense value inside the exclusive WA members area. I hope this will help many people find their online business "Home" in WA. Timing is everything. And to everything there is a season. This is your season to make your mark. Happy to hear that you were getting plugged in. See you at the top! Awesome training Kyle, thank you so much. This is definitely a golden opportunity to be pursued. Thanks K&C to you both. The sample schedule is a very nice bonus, one question, could you elaborate on "Share your email link to this post in at least 5 places"
for some reason I don't quite understand that one, I may be overthinking it though. Either do I...lol! I will update that so that it makes sense. It was intended to say "shortlink". Now that makes sense. Thanks alot. Thanks for the feedback and yes we have been very busy and will continue to work hard to better serve the community here through new developments, new features, new training, and system improvements. This gives you the opportunity to share with ease and to earn money in the process! I have always been amazed at the volume and quality of information here at WA. Sharing will only enable more to benefit from the knowledge. People are able to create their own opinions from information viewed - true seller. Another very welcomed change. Thanks for the valuable feedback Elaine! Sharing content that is of Quality only benefits every party involved. I'm glad that you are going to help spread the word about the contributions from people at WA. (off topic) been a long time since being logged on here and wondering...what happened to the WA blog theme setup that was available way back? and the report and emails to give away from blog also? Blog theme set-up? If you are referring to the website builder, you can find it under Build Websites within WA. We removed the "Blog & Funnel" system because it was highly outdated and was essentially duplicate content which goes against all of Google's ranking algos. Much better off to create your own content, from your own perspective and own voice. This training is going to help many people at Wealthy Affiliate Earn their very first online income and it's something that you can feel good about. Sharing helpful content from within WA helps your audience, your reputation, and builds credibility for the author of the content. If you have any questions about this training, let's discuss it here!